Can Pyro control The Human Torch? Pyro's powers involve controlling fire, which is exactly what the Torch's abilities are. 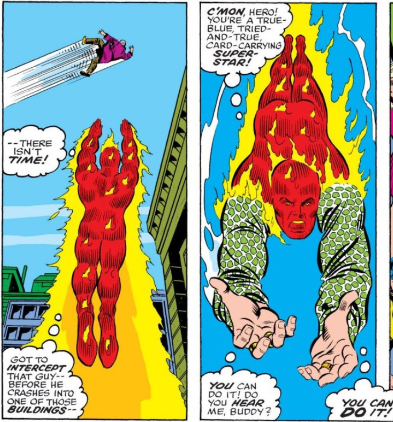 I'm interested to learn whether Pyro can control The Human Torch in any way? The only thing that makes me wonder is due to the fact that it's fire produced by exposure to cosmic radiation. 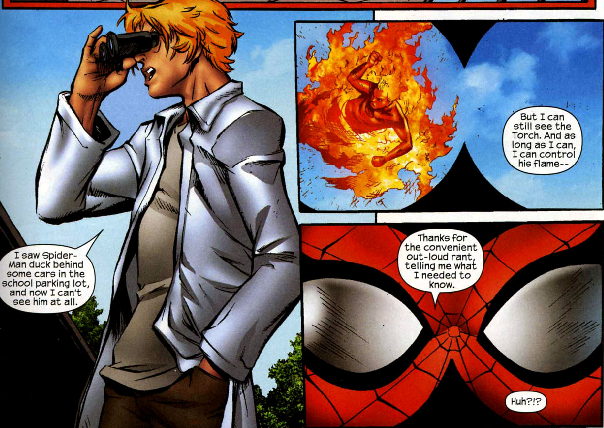 Pyro is entirely capable of controlling Johnny Storm (The Human Torch), up to and including making his flames hotter, physically controlling his body and making him fight other superheroes (at least according to Marvel Adventures: Spiderman #31). He can't even turn his flame off to regain control of himself. As long as Pyro knows where Torch is, he can control him. 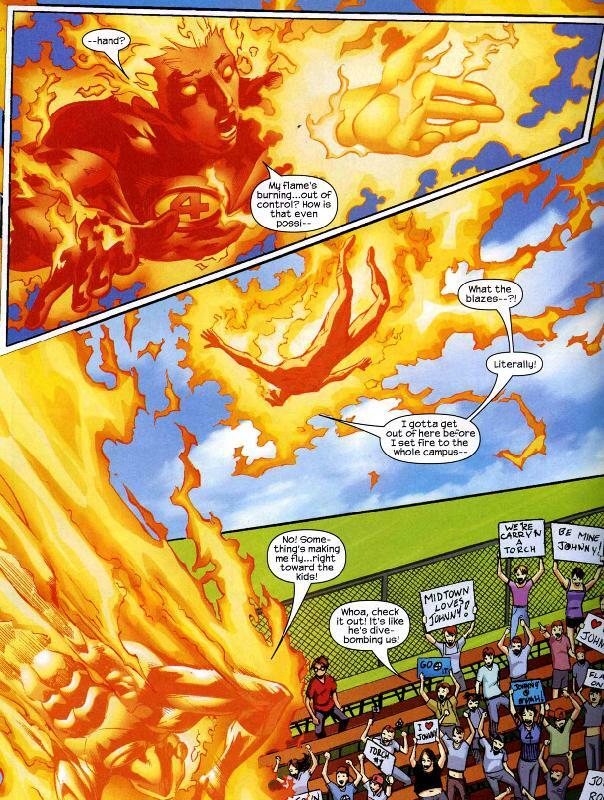 Generally, the Human Torch has been portrayed as surrounding himself with flame, rather than transmuting his body into some sort of plasma. If he were truly made of flame, he might let bullets simply pass through him, instead of melting them before they reach him. Similarly, he wouldn't have to worry about dodging large objects thrown at him. If the rest of his body was simply flame (as opposed to a human body, with bones and muscles), then what's holding his arms where they are, and how is he going to use them to grab that guy and lower him to safety? That said, I should note that this scene is from a comic published in 1975. It's possible that someone has changed how the character's powers work since then; certainly there have been multiple stories that point out how the FF resemble the ancient four "elements": earth (Thing), air (Invisible Woman), fire (Torch), and water (Mr. Fantastic). this also predates the various Handbooks Marvel has published over the years. I picked the scene because it was the first one I thought (possibly because it was from one of the first FF comics I bought). One of the biggest differences between Pyro's power and the Torch's is that the Torch can generate fire, whereas Pyro can only manipulate fire that already exists. So, to your question: as PlutoThePlanet says in his comment, the Torch doesn't actually become flame. Pyro would be able to use the flame surrounding the Torch's body, and new flame the Torch generated, but not control Johnny's actual body. And, apparently, controlling the flame surrounding Johnny's body actually allows him to control Johnny's body (similar to how Magneto might be able to control Iron Man's armor, but not control Tony Stark himself), and prevent the Torch from "flaming off." There's likely some argument as to whether or not the fire that Johnny generates is even technically "fire" at all. That could just be a colloquial term for a very esoteric energy that only resembles fire visually. Wiki specifies that he generates "fiery plasma", for example. In the first two issues of the book, he's described as transmuting completely into flame, later amended to an aura of the aforementioned plasma. So since Pyro only seems to be able to control conventional flame, he likely could not control Johnny's "flame". If Johnny set something ON fire with the heat from his energy, Pyro could almost certainly affect that. Not the answer you're looking for? Browse other questions tagged marvel x-men fantastic-four or ask your own question. Jim/The Human Torch in Secret Avengers? Can Magneto control light as well? Do we know if the Human Torch needs to breathe oxygen? How can Invisible Woman see? Have the two Human Torches ever met? 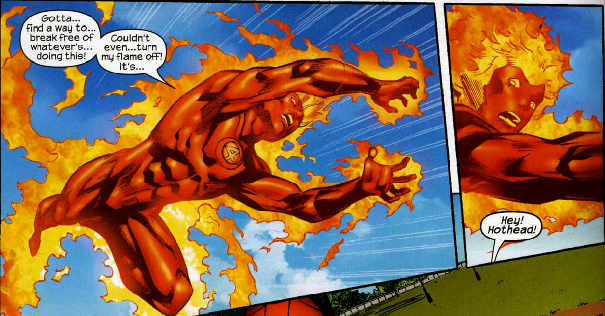 How many calories does the Human Torch burn?